The town that Russian author Isaac Babel references in this passage is the storied Black Sea metropolis of Odessa. Founded in 1794 by Russian Empress Catherine the Great, the seaport was envisioned as a new kind of imperial city—an orderly and modern economic crossroads. The city’s position on the periphery of the Russian Empire, however, lent it a frontier-like atmosphere. A wildly diverse, multilingual population of merchants, adventurers and fortune hunters was thus attracted to the city’s openness and engaging mix of high and low culture. Situated in what is now southern Ukraine on terraced hills overlooking the Black Sea, Odessa’s location near major rivers enabled it to ship goods throughout Russia and beyond. Trade in grain, fish, oil and produce fueled the city’s economy, and its warm climate and brightly hued architecture imbued it with a Mediterranean ambiance. A state-of-the-art tram system carried citizens, while commodities such as tea from China, cotton from the United States and oranges from Jerusalem were carted to market over streets paved with stones from Mt. Vesuvius. 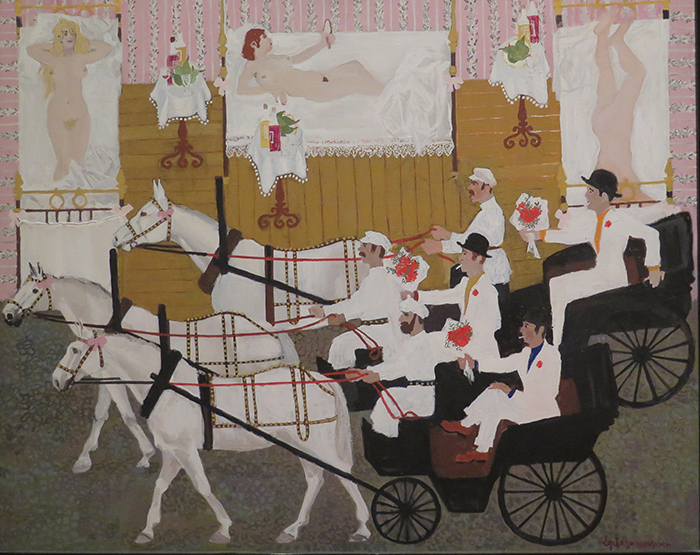 “Blessings to the Bride and Groom”—In many of Ladyzhensky’s paintings people appear to be sitting without chairs. This absence alludes to the persistent fuel shortages that caused Odessans to burn their furniture for heat. The winter of 1921 was particularly harsh. Isaac Babel (1894–1940) is among the most important Jewish and Russian writers of the 20th century. He was a journalist, short story writer, playwright and screenwriter whose work was influenced by his roots in Odessa’s largely Jewish Moldavanka neighborhood. He garnered worldwide attention with the 1926 publication of Red Cavalry, based on his experiences during the Polish-Soviet War. A victim of the Stalinist purges, he was arrested in 1939 and executed in 1940. 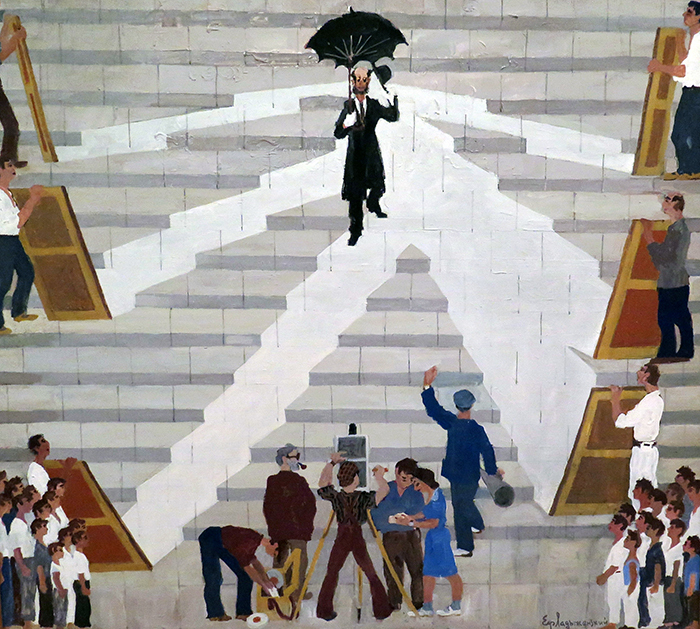 The son of a fish salter, Yefim Ladyzhen-sky (1911–1982) was a state-employed artist who designed sets and costumes for the theater and cinema. 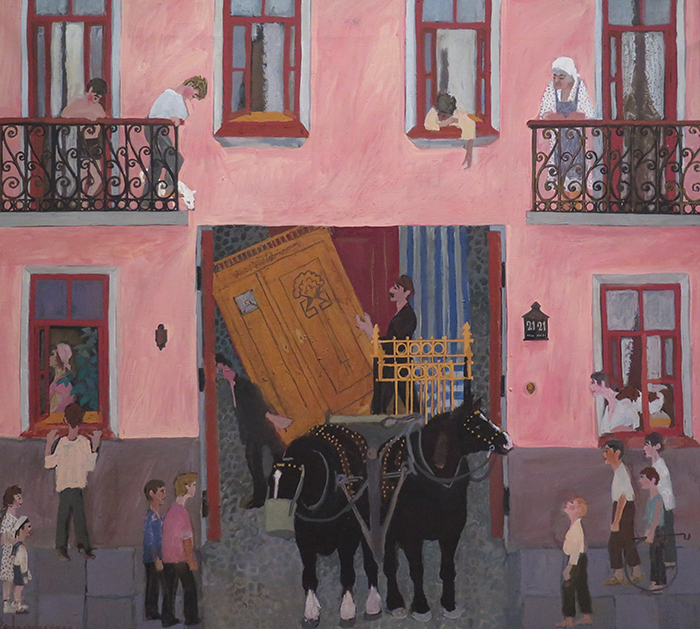 In the 1960s and ’70s, he painted “Growing Up in Odessa,” a series chronicling life in the city during his childhood. 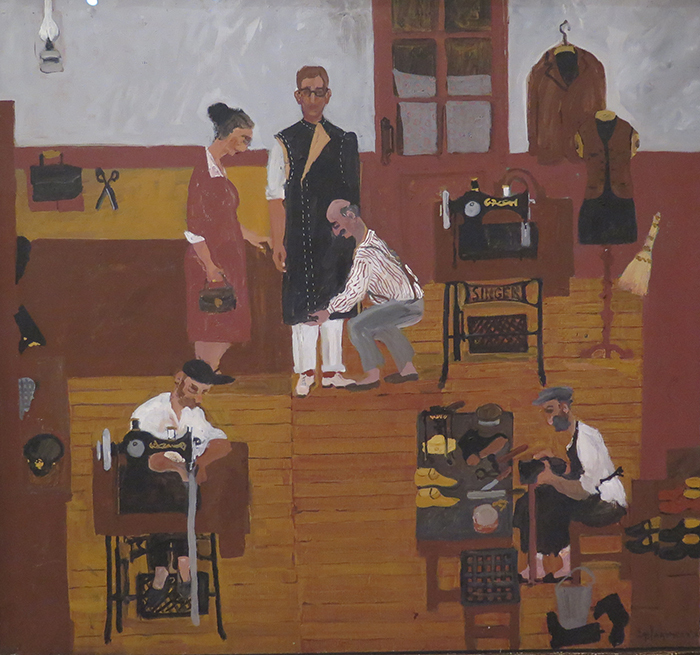 His works depict daily life in a city trying to maintain its identity during occupations by revolutionary and counterrevolutionary forces and amid the turmoil created by Soviet economic and social policies of the 1920s and ’30s. His scenes are closely akin to Babel’s Odessa Tales, which tells the story of a group of Moldavanka Jewish gangsters at the time of the Bolshevik Revolution. 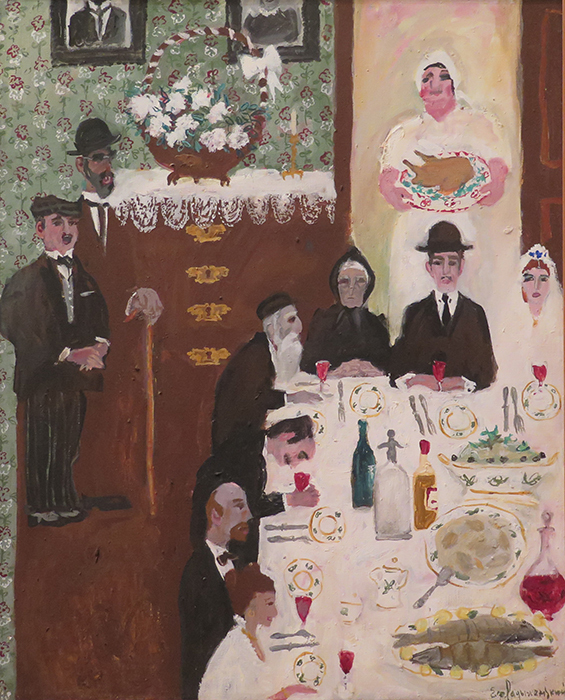 The artist’s focus on Jewish subjects and his implied criticism of Soviet society rendered his work taboo in the U.S.S.R. In 1978, he left for Jerusalem. “Moving to a New Apartment”—The Soviet regime’s nationalization of housing divded private homes into multifamily and communal housing. Like many middle-class families, the Ladyzhenskys were forced to move to a new home. “Three Craftsmen Sharing One Permit”—The nationalizing of private enterprise overturned traditional social and commercial roles, affecting tens of thousands of Odessan Jews, from professionals and merchants to innkeepers and artisans. For both Babel and Ladyzhensky, the city’s character was defined by its inhabitants—traders, bankers, shippers, street musicians and royalty alike. Both men identified with the bawdy culture of Moldavanka’s underworld. Each interpreted his city during the years before and after the Bolshevik Revolution through an Odessan lens, typified by a distinctively Jewish sardonic wit. In the 19th and 20th centuries, thousands of Jews were drawn to Odessa in pursuit of economic, social and cultural opportunities. By 1900, more than a third of its population was Jewish, and the city became an incubator for Jewish literature, art and politics. The 1917 Bolshevik Revolution ended Czarist rule and was followed by years of political chaos, social upheaval, economic collapse and civil war that continued until 1923. By the 1920s, obtaining even the most basic goods was difficult. Anti-Jewish sentiment grew during these years, and many Jews left. But despite Soviet economic reforms, social transformations and the strife of the 1920s and ’30s, Odessa’s cosmopolitan character endured. Craftsmen transformed grand buildings into communal housing, gangsters still strutted through the streets, cafés remained central to daily life, and commerce, though diminished, continued. “The Movie Comes to Town”—Soviet leaders supported the nascent film industry to spread Marxist ideology. Some of the earliest Soviet films, such as Jewish Luck, written by Babel and filmed on the Odessa steps, featured Jewish stories. “Bandits Off to Their Sweethearts”—Odessa’s wealthy Jewish merchants and bankers lived as members of the Russian elite along the city’s broad boulevards. The densely populated and poor Moldavanka neighborhood was home to a colorful underworld of bold Jewish gangsters.